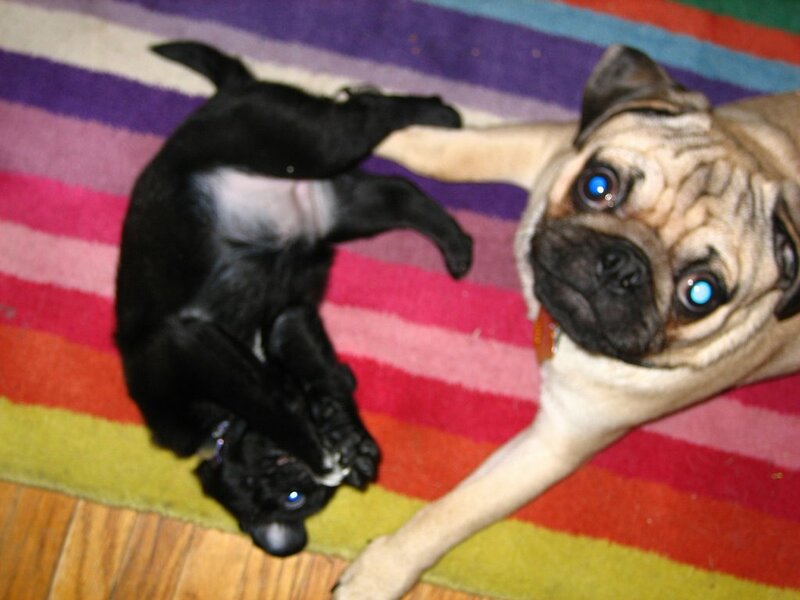 Life with Pugs | Separated by a common language. All went well with my presentation! Hurrah! Instead of being one hour long, it ended up being a FOUR HOUR presentation (because of questions and discussions). FOUR HOURS!!! WTF?! Anyhow, I got emails form my co-workers after saying what a good job I did, which was pretty sweet coming from my older peers. And now for more interesting topics! MY DOGS! 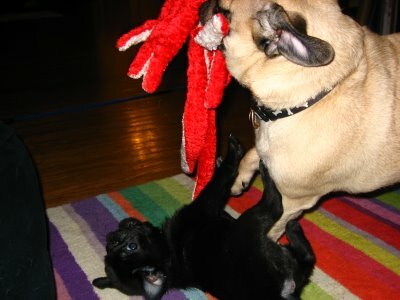 Here’s a photo of Zelda trying to eat Winston’s face (and failing). This was one of my favorites because Zelda has a nice large chunk of Winston’s face in her mouth…hahahaha. So good. Pugs are great! geeeesh four hours? you must have been super impressive. I love the puppy pics – looks a lot like what’s going on around here. I will have you know that you have turned my best friend (who I’m not sure if you’ve met) onto Pugs and now she wants one. THANKS, Thanks a LOT, L.
It’s funny. After all that work getting Winston’s other ball to descend and you’re gonna chop ’em both off. Yeah we’re kind of sad about him having to give them up after worrying about them dropping to begin with. Man they are getting big! Like HUGE. I wonder what the vet does with them after they cut ’em off? Hey, landed on your blog, nice stuff. I found a cool new tool for our blogs… http://www.widgetmate.com It helps get latest news for our keywords directly on to our blog. I added it on mine. Worked like a charm.